Made to vend in machines with a 1 inch gumball wheel. 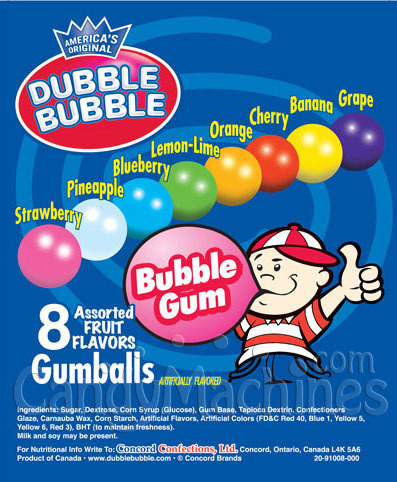 Popular Dubble Bubble Fruit-Flavored Gumballs in an assortment of 8 different colors. Famous Dubble Bubble logo is printed on every one. Dubble Bubble is one of the most recognized names in the world of gumballs. Made by Concord, these bulk vending gumballs are gluten-free, made in a nut-free facility, and OU Kosher Certified. This gum typically vends for 25¢ in commercial vending machines that have a 1" gumball dispensing wheel. Gum stores best in a cool, dry, low humidity location. Their shelf life can be up to 18 months if not exposed to extreme hot or cold temperatures. from NE Assorted double bubble gumballs!! Great gum!!! Good flavor! Soft! Just like when I was a kid. Thanks! Items for personal enjoyment !!! Luv em You have an amazing variety to choose from !! I Purchase 2 vending machines and they are everything I excepted. sturdy, solid and durable. My kids love them! setup is quick and easy and the customer service is outstanding. This company is the real deal and I will recommend for future purchases to family and friends.